"Kingdom of Rus'" redirects here. For Tsardom of Rus', see Tsardom of Russia. For other uses, see Galich (disambiguation). A map of Central and Eastern Europe during the 13th–14th centuries, showing the Galician–Volhynian Kingdom (center, in dark green). After the enormous destruction wreaked by the Mongol invasion of Kievan Rus' in 1239 to 1241, Prince Danylo Romanovych was forced to pledge allegiance to Batu Khan of the Golden Horde in 1246. He strove to rid his realm of the Mongol yoke, however, by a formal orientation to Western Europe (coronation as a "Rex Rusiae" by a papal legate in 1253) and by trying unsuccessfully to establish military alliances with other European rulers. The Polish conquest of the kingdom in 1349 ended its vassalage to the Golden Horde. After the fall of the Roman Empire, the area was populated by Slav people, identified with groups called Buzhans, Dulebes and Croats. The southwestern edge of the land was probably part of the Great Moravian state. In 907, Galician Croats and Dulebs were involved in the military campaign against Constantinople led by Rus' Prince Oleg of Novgorod. This is the first significant evidence of the political affiliation of native tribes. Around 970, the eastern edge of this territory was probably included into the Piast dynasty state. The area was mentioned in 981 (by Nestor), when Vladimir the Great of Kievan Rus' took over on his way into Poland. He founded the city of Volodimir (Volynskii) and later Christianized the locals. In the 12th century, the Rurikid Principality of Halych was formed there by descendants of Vladimir the Great. It merged at the end of the 12th century with the neighboring Principality of Volhynia into the principality of Galicia–Volhynia, which existed with some breaks for a century and a half. In 1205 Roman turned against his Polish allies, leading to a conflict with Leszek the White and Konrad of Masovia. Roman was subsequently killed in the Battle of Zawichost (1205), and his dominion entered a period of rebellion and chaos. Thus weakened, Galicia–Volhynia became an arena of rivalry between Poland and Hungary. King Andrew II of Hungary styled himself rex Galiciæ et Lodomeriæ, Latin for "king of Galicia and Vladimir [in-Volhynia]", a title that later was adopted in the Habsburg Empire. In a compromise agreement made in 1214 between Hungary and Poland, the throne of Galicia–Volhynia was given to Andrew's son, Coloman of Lodomeria, who had married Leszek the White's daughter, Salomea. Under Danylo's reign, Galicia–Volhynia was one of the most powerful states in east central Europe. Literature flourished, producing the Galician–Volhynian Chronicle. Demographic growth was enhanced by immigration from the west and the south, including Germans and Armenians. Commerce developed due to trade routes linking the Black Sea with Poland, Germany, and the Baltic basin. Major cities, which served as important economic and cultural centers, included Lvov (where the royal seat would later be moved by Danylo's son), Vladimir-in-Volhynia, Galich, Kholm (Danylo's capital), Peremyshl, Drohiczyn, and Terebovlya. Galicia–Volhynia was important enough that in 1252 Danylo was able to marry his son Roman to the heiress of the Austrian Duchy in the vain hope of securing it for his family. Another son, Shvarn, married a daughter of Mindaugas, Lithuania's first king, and briefly ruled that land from 1267 to 1269. At the peak of its expansion, the Galician–Volhynian state contained not only south-western Rus' lands, including Red Rus' and Black Rus', but also briefly controlled the Brodnici on the Black Sea. After Danylo's death in 1264, he was succeeded by his son Lev, who moved the capital to Lviv in 1272 and for a time maintained the strength of Galicia–Volhynia. Unlike his father, who pursued a Western political course, Lev worked closely with the Mongols, in particular cultivating a close alliance with the Tatar Khan Nogai. Together with his Mongol allies, he invaded Poland. However, although his troops plundered territory as far west as Racibórz, sending many captives and much booty back to Galicia, Lev did not ultimately gain much territory from Poland. Lev also attempted, unsuccessfully, to establish his family's rule over Lithuania. Soon after his brother Shvarn ascended to the Lithuanian throne in 1267, he had the former Lithuanian ruler Vaišvilkas killed. Following Shvarn's loss of the throne in 1269, Lev entered into conflict with Lithuania. From 1274 to 1276 he fought a war with the new Lithuanian ruler Traidenis but was defeated, and Lithuania annexed the territory of Black Ruthenia with its city Navahrudak. In 1279, Lev allied himself with king Wenceslaus II of Bohemia and invaded Poland, although his attempt to capture Kraków in 1280 ended in failure. 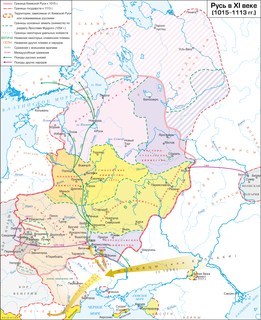 That same year, Lev defeated Hungary and annexed part of Transcarpathia, including the city of Mukachevo. In 1292 he defeated Poland and added Lublin with surrounding areas to the territory of Galicia–Volhynia. After 1352 most of the Ruthenian Voivodeship belonged to the Crown of the Polish Kingdom, where it remained also after the Union of Lublin between Poland and Lithuania. The present-day town of Halych is situated 5 kilometres (3.1 mi) away from the ancient capital of Galicia, on the spot where the river port of the old town was located, and where King Liubartas of Galicia–Volhynia constructed a wooden castle in 1367. By the treaty of the Union of Lublin of 1569, all of the former principality of Galicia–Volhynia became part of Poland. In 1772, Empress Maria Theresa of Austria (who was also Queen of Hungary) revived the old Hungarian claims to the Kingdom of Galicia and Lodomeria (Regnum Galiciæ et Lodomeriæ), using them to justify the participation of Austria in the partitions of Poland. Royal seal of George I of Halych (1301–1308) "S[igillum] Domini Georgi Regis Rusie", "S[igillum] Domini Georgi Ducis Ladimerie". ^ "Oleg of Novgorod | History of Russia". historyofrussia.org. Retrieved 2016-02-14. ^ Charles Cawley (2008-05-19). "Russia, Rurikids – Chapter 3: Princes of Galich B. Princes of Galich 1144-1199". Medieval Lands. Foundation of Medieval Genealogy. Retrieved 2009-12-26. ^ Vernadsky, George. (1970). The Mongols and Russia. A History of Russia, Vol. III. New Haven: Yale University Press pp. 144-149. ^ a b Vernadsky, George. (1970). The Mongols and Russia. A History of Russia, Vol. III. New Haven: Yale University Press pg. 157. Subtelny, Orest (2000). Ukraine: A History. University of Toronto Press. ISBN 0-8020-8390-0. Греков Б. Д. Древнейшие судьбы славянства в Прикарпатских. областях // Вестник АН СССР. 1940. No. 11-12. Wikimedia Commons has media related to Halych-Volhynia. Demetrius of Liubar or Liubartas was Prince of Lutsk and Liubar (Volhynia) (1323–1383), Prince of Zhytomyr (1363–1374), Grand Prince of Volhynia (1340–1383), Grand Prince of Galicia and Volhynia (1340–1349). Principality of Halych, or Principality of Halychian Rus', was a medieval East Slavic principality, and one of main regional states within the political scope of Kievan Rus', established by members of the oldest line of Yaroslav the Wise descendants. A characteristic feature of Halych principality was an important role of the nobility and citizens in political life, consideration a will of which was the main condition for the princely rule. Halych as the capital mentioned in around 1124 as a seat of Ivan Vasylkovych the grandson of Rostislav of Tmutarakan. According to Mykhailo Hrushevsky the realm of Halych was passed to Rostyslav upon the death of his father Vladimir Yaroslavich, but he was banished out of it later by his uncle to Tmutarakan. The realm was then passed to Yaropolk Izyaslavich who was a son of the ruling Grand Prince of Kiev Izyaslav I of Kiev. Andriy II Yuriyevych or Andrew of Galicia was the last Rus' king of Galicia-Volhynia in 1308–1323. He was the son of Yuriy I (1252–1308) whom he succeeded on the royal throne of Galicia. His mother was Euphemia of Kuyavia. After the death of his father, he ruled the kingdom together with his brother Lev II. Though the kingdom was one being managed together, there are sources informing that Andrew was seated in Volodymyr-Volynskyi and Lev II in Galicia. Halych Raion is a raion (district) of Ivano-Frankivsk Oblast (region) in Ukraine. The town of Halych serves as the administrative center of the district. Population: 44,217 (2016 est.). Galicia–Volhynia Wars were several wars fought in the years 1340–1392 over the succession in the Principality of Galicia–Volhynia. After Boleslaw-Yuri II was poisoned by local nobles in 1340, both Grand Duchy of Lithuania and Kingdom of Poland advanced claims over the principality. After a prolonged conflict, Galicia–Volhynia was divided between Poland (Galicia) and Lithuania (Volhynia) and the principality ceased to exist as an independent state. Poland acquired a territory of approximately 52,000 square kilometres (20,000 sq mi) with 200,000 inhabitants. The Principality of Volhynia was a western Kievan Rus' principality founded by the Rurik dynasty in 987 centered in the region of Volhynia, straddling the borders of modern-day Ukraine, Belarus, and Poland. 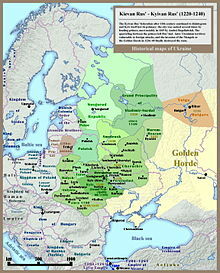 From 1069 to 1118 it belong to Izyaslavichi who primarily ruled from Turov. After losing Turov to Monomakhovichi in 1105, the descendents of Izyaslav Yaroslavovich for a few years continued to rule in Volhynia. From 1154 to 1199 the principality was named Principality of Vladimir when the Principality of Lutsk (1154-1228) was separated.